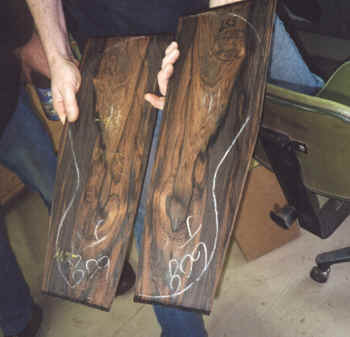 A nice set of Brazilian Rosewood. Precision is an ever present concern for any guitarmaker, and Jim's work is remarkable for its precision. Just a few of the routers Jim uses. Typically he will set up a router for a certain job and use it just for that job. 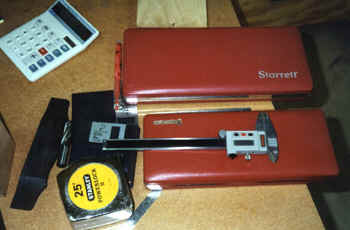 This increases the investment in routers but saves a lot of time and increases precision. More routers -- these are for cutting the purfling and binding ledges on the back of guitar bodies. 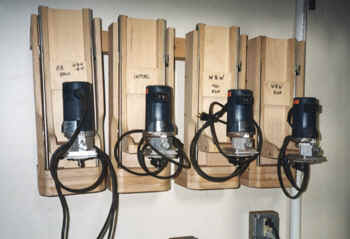 They are mounted in jigs made by Jim which are very similar to those sold (or at least, plans and parts) by LMI. This jig is for bending sides. Jim has four, one for each body shape. 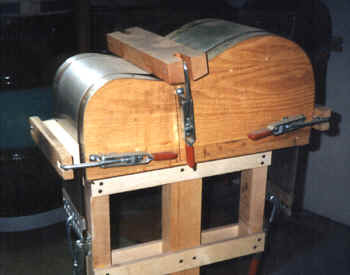 Jim uses silicone rubber heating blankets made by Watlow to provide the necessary heat, and the various clamps hold the sides in place. Jim recently bought a laser engraving and cutting tool, and to demonstrate it to me, he made this nice little sign. It took maybe 5 minutes, and the lettering is cut very cleanly to a uniform depth. Quite amazing!! !